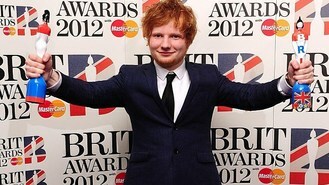 Ed Sheeran was celebrating after picking up two awards at the 2012 Brits. He landed best British breakthrough and beat stars such as Professor Green and Noel Gallagher to take best British male. Sheeran - whose hits have included Lego House and The A Team - thanked his manager Stuart Camp who he said was responsible for turning the "spotty, chubby, ginger teenager into the person up here tonight". Adele was beaten to the title of best single by heartthrob group One Direction for their track What Makes You Beautiful. Coldplay took the best British group title for a third time, following wins in 2001 and 2003. It was their seventh Brit in total. Collecting the prize, Chris Martin said it was "humbling" to win. Bruno Mars took the best international male prize, while Rihanna collected the best international female for the second year running. Lana Del Rey fought back tears and thanked her record label in Germany as she collected her Brit Award for best international breakthrough. Foo Fighters were named best international group. The annual event at London's O2 Arena saw many of the biggest stars in music attending and performing. Major names who gave spectacular performances included Rihanna and Florence + The Machine. Adele has no plans to move to the US, she has revealed. Sergio Mendes will attend the Academy Awards on Sunday with mixed feelings. Arlene Phillips has revealed that Whitney Houston had a secret loathing of her feet. The organisers of the Brits have apologised to Adele after she was unceremoniously forced to cut short her acceptance speech for the top gong at this year's awards. US President Barack Obama was left singing the blues with artists including Mick Jagger after a night of music at the White House. Adele's album 21 has spent 21 weeks on top of the US Billboard's Top 200 albums chart - and its 21st week is the biggest one yet. One Direction have dedicated their unexpected Brits win to their fans, and joked that they would have to break the award up between the five of them. Adele has been crowned the queen of the Brits 2012 - but saw her big moment ruined when her speech was cut short. Adele took the first of the honours at the 2012 Brit Awards as she landed the best female artist prize.